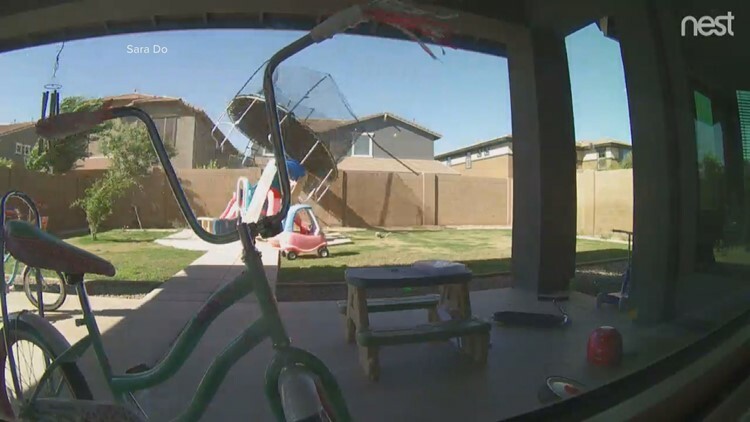 High winds in Gilbert, AZ Wednesday caused a trampoline to take flight. The flying trampoline hit Sara Do's kid's play structure and two parts of a wall, breaking both, before ending up in a neighbor's pool. Check out the moment the trampoline takes flight! Winter weather is sneaking back into the Valley Tuesday and Wednesday. 12 News meteorologist Lindsay Riley tells you what to expect in the hours ahead. 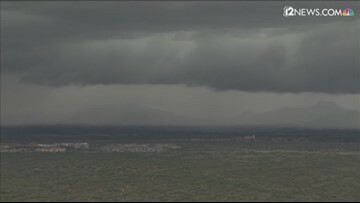 Another winter storm has hit the Valley and Sky 12 captured some massive clouds releasing a downpour over the area. 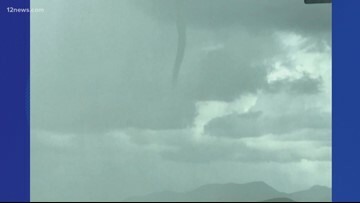 A possible cold air funnel was spotted in the East Valley. Conditions are improving as the storm moves eastward. The storm should come to an end overnight. 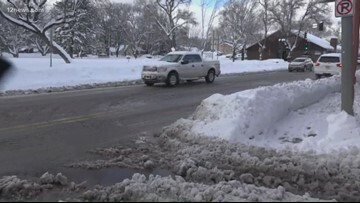 Some roads are ready for cars after a historic snowstorm in Flagstaff. 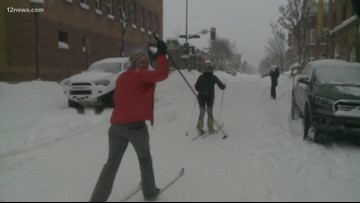 But for those roads that are not car ready people are taking to their cross country skis to get around. 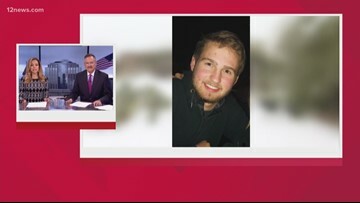 A 17-year-old Valley teen went missing last night when his truck got stuck in the snow after he veered off the street. He was stranded overnight on Seven Springs Rd. He slept in his truck overnight and walked out this morning. It doesn't come around often so people are taking full advantage of the snowfall in Scottsdale. 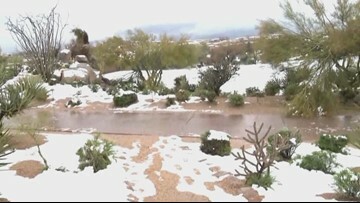 Check out the snow sticking to the ground in North Scottsdale. 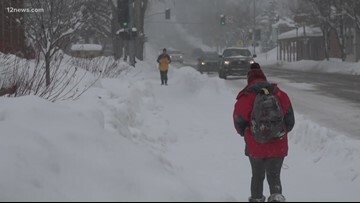 A Colorado woman was trying to make it to Phoenix before the storm hit, but like the rest of Arizona, her plans were altered thanks to the historic snowstorm that hit the High Country. 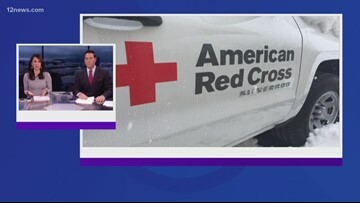 The Red Cross has opened shelters in Kingman, Pine and Payson. 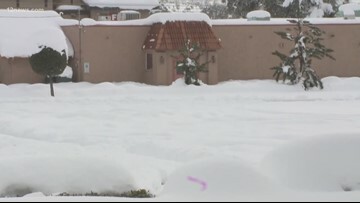 They are providing people with a warm place to get snacks, cots and care amid a record-breaking snowstorm in Arizona. 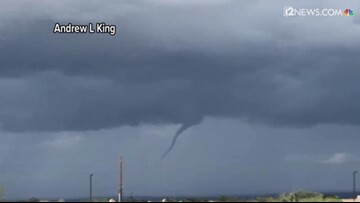 What can you see in Flagstaff right now? Snow, of course! But also, you can now see roadways as the snow is finally starting to let up. Believe it or not, snow that actually stuck is still covering the ground in Scottsdale. And it's the kind of snow that is great for making snowballs. Main roads may be clear in Prescott, but looks are deceiving. Side roads are still impassable in places throughout Prescott. Posse members are helping people with essential jobs get around. Love makes you do crazy things like walk through record-breaking snowfall to get to your significant other. At least that's what one Flagstaff woman did to get to her man. 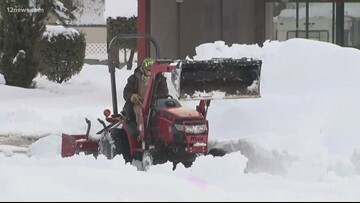 Payson has received so much snow that the town's mayor had to declare a state of emergency. The snow is heavy and people need to proceed with caution. 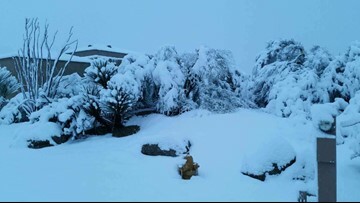 Some residents in North Scottsdale say they woke up to 8" of snow this morning. No one says they were prepared for the wintery weather.